Because it contains black chokeberry, cranberry, bilberry, and grapes extracts, as well as vitamin C, the product helps protect your body against free radicals, especially in skin, e.g. it reduces the effects of excessive sun exposure. Green tea leaf extract supports burning fat tissue. 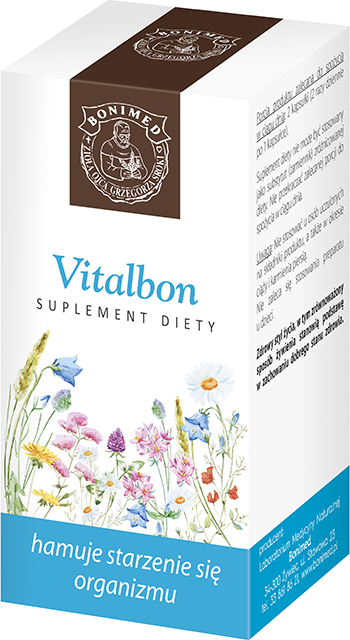 Vitalbon supports normal digestion and functions of the digestive system, including its detoxification thanks to ginger root and cinnamon bark contents. Because it contains horsetail herb, it stimulates the diuretic and detoxifying functions of the kidneys, as well as it improves the condition of hair, skin, and nails. Because it contains Baikal skullcap root extract, it supports cell renewal, especially in skin. It also reduces discoloration caused by excessive tanning (it protects skin against UV radiation). Ingredients: Baikal skullcap extract, gelatin, cinnamon bark, cranberry fruit extract, green tea leaf extract, horsetail extract, L-ascorbic acid, bulking agent (maltodextrin), black chokeberry fruit extract, ginger root extract, bilberry fruit extract, grapes (fruit) extract, anti-caking agent (magnesium stearate, silicon dioxide). Recommended daily intake of the product (2 capsules) contains: Baikal skullcap extract 300 mg, cinnamon bark 120 mg, cranberry fruit extract 100 mg, green tea extract 100 mg, horsetail extract 90 mg , vitamin C 80 mg*, black chokeberry fruit extract 40 mg, ginger root extract 24 mg, bilberry fruit extract 20 mg, grapes (fruit) extract 6 mg. Caution: Don’t use it if you are allergic to the product ingredients. If you are pregnant or breastfeeding, don’t use it. Taking the product by children is not recommended.